Background: First person, or subjective, experiences of persons with schizophrenia are recognized to play a fundamental role in the outcome. From psychoanalytic, existential, phenomenological, rehabilitation-oriented and dialogical perspectives, this review explores five descriptions of alterations in subjective experience, which are sometimes called self-disorders. While each provides rich accounts of these experiences, we conclude that each fails in some way to adequately account for how persons move into, or develop, alterations in self-experience, and how they move out of them or recover. 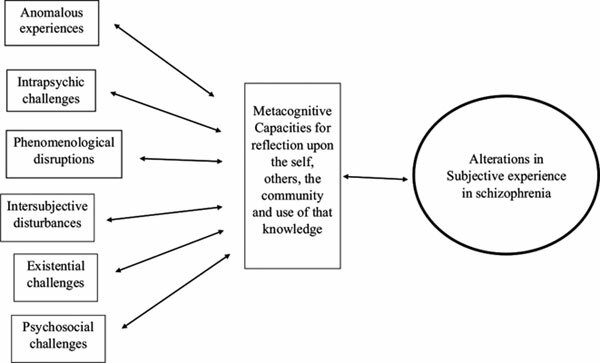 Method: To address these limitations, we review research on the integrated model of metacognition in schizophrenia which offers an account of how self-experience may be compromised and later recaptured in ways that could be influenced by a range of psychological, social and biological phenomena. Results: We argue that research on metacognition suggests decrements in metacognitive function may partially account for the emergence of these difficulties and also explain how their resolution contributes to recovery. Conclusion: With the loss or recapture of metacognitive capacities, the socially-positioned, interpersonal lives of persons seem to lose or gain saliency, which in turn undermines or enables persons to develop a working sense of themselves that orients them purposefully and allows them to address challenges. Metacognitively oriented treatments which promote awareness of personal experience regardless of the level of fragmentation and work with persons as they slowly develop the ability to integrate information about themselves and others may offer unique promise for promoting recovery. Schizophrenia, self, metacognition, recovery, psychosis, phenomenology, psychoanalysis, rehabilitation.